For thousands of years these waterfalls have enchanted one and all. They have been a source for many myths and miracles. And continue to remain so. 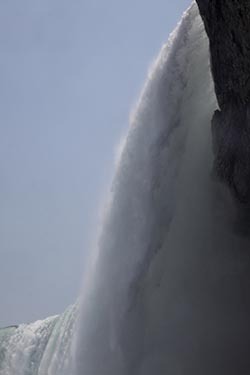 Visitors have no other option but to gasp… irrespective whether the falls are being viewed from the US side or from the Canadian side. In my opinion, the Canadian side has a slight edge though. I had the honour of being one of the first few passengers on the newly launched Mauiva Aircruise’s All American East Experience. In 6 days we would be covering Niagara Falls, Toronto, Niagara-on-the-Lake, Lancaster, Harrisburg, Mount Vernon, Arlington and Washington DC. The trip would include many attractions in each of the locations. The best thing of the trip, which probably sets Mauiva Aircruise apart, is the fact the all travels between destinations are by chartered flights… meaning saving hours and hours of bus travel and the hassles of airport lines and security. What could be better than stepping out from the plane and hopping on a waiting bus to take you around the city and resting you in great hotels with breakfasts and dinners included. The price would delight even the cost accountant in you. The package tour commences and ends in New York. I checked in the previous night at Hotel Hudson located in midtown Manhattan’s 58th Street – which was to be the tour’s departing point early next morning. At 6:45AM the next day, we boarded the waiting bus and left for Morristown’s KMMU airport which was about a ninety minute drive from New York City. Crossing the 2-mile long Lincoln Tunnel, under the Hudson River we reached the airport which was in New Jersey, the neighboring State. Well, New Jersey is not the subject of this feature, but good to know that NJ is home to the famous Princeton University. In its library is the preserved brain of Albert Einstein – the famous scientist. The plane was waiting for us at the airport. In 15 minutes we were all set to fly. And in the next 90 minutes, cruising at an altitude of 17,000 feet, we were at Niagara Falls International Airport that’s on the American side. 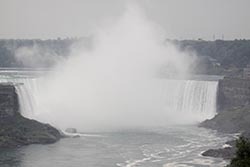 In the next 30 minutes we were on the Rainbow Bridge that connects USA with Canada and that gave us the first view of the mighty falls. At the other end of the bridge was Canada’s immigration centre. It took us just about 20 minutes to clear it all. However, if luck is not on your side you could be in a queue of buses… and that could take real time to cross the border. There’s some confusion when it comes to the names of the towns around. Niagara is a region that falls between Lake Ontario and Lake Eerie. 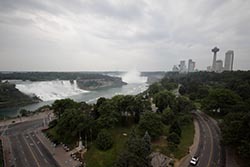 The region covers 12 municipalities and Niagara Falls is just one of them. 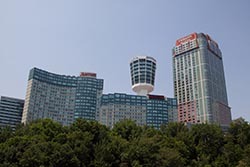 While the local population of Niagara is just around 100,000 it attracts over 20 million visitors every year! Obviously, tourism is the major source of revenue for the region. This also means that during holidays and weekends be prepared to rub shoulders with crowds and negotiating long lines. The town and the Niagara Parks Authority have done a good job to keep visitors well engaged. Over 200 scenic trails, historic sites, museums, casinos, hotels and restaurants all add up the glory of the region. If you are going to be around for just a couple of days, as we were scheduled, I would strongly suggest taking the 2-day Adventure Pass. While this pass was included in our tour, it would cost you about Canadian $45 and will give you access to 4 top attractions and transportation. At the time of writing USA and the Canadian currency were traded at par. 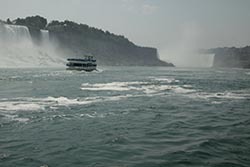 The 4 attractions are Maid of the Mist, Journey Behind the Falls, Niagara’s Fury and White Water Walk. While most of the attractions are within walking distance, unlimited transportation in local buses called Peoplemover is included. After clearing immigration, our first stop was to enjoy Maid of the Mist. A little walk and a lift ride bring you all the way down to the banks of the river. Waiting boats take you quite near to both the falls – the American Falls and the Canadian Horseshoe Falls. Yes, you are given makeshift raincoats but soaking in the water spray and getting lost in the mist is quite an experience. This is a must do trip. In about 30 minutes we were back on the shore, ready to walk towards Table Rock which offers 2 of the 4 attractions and shopping, restaurants as well as visitor services. The walk runs parallel to the river, albeit a few hundred feet above offering spectacular views. By 12 noon we all met at the Table Rock. Journey Behind the Falls is walking the scenic tunnels created right beneath the falls. 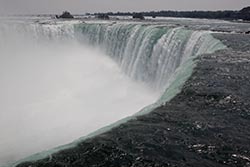 3 observation points take you up close near the Canadian Horseshoe Falls. Of course, you would want to soak up once again, if you have to. Niagara’s Fury is a 4-D show that takes you back in time 10,000 years to experience the creation of the falls. Temperature drops 20 degrees; water will bubble and spray while snow falls all around. Standing in the mist on a platform you will feel the full wrath of Mother Nature as the floor shakes and trembles beneath you. This is also a must do. After the 2 experiences, our bus dropped us at the Riverview hotel. We were given an hour of free time to enjoy lunch and explore around. Post that, we boarded our bus to experience the 4th attraction – White Water Walk. 4 kms away on the road towards Toronto, stands the attraction. An elevator takes you down 270 feet. From here we took a stroll on the specially created board walk to overlook some of the world’s wildest rapids deep in Niagara Great Gorge. After about 40 minutes we took the elevator up to board our bus to be brought to Sheraton which would be our hotel for the next 2 nights. I got a room on the 4th floor giving me a good view of the American Falls. There are many hotels on the Canadian side… just make sure you get a room with a view! Every dollar you would pay extra would be worth it. Refreshed, we were ready by 8PM to enjoy our dinner at the Elements located at Table Rock. Their restaurant overlooks the Horseshoe Falls. The dinner menu matched well with the view. After sunset, every evening, the falls are illuminated. Lights with hues of red, yellow, blue and green falling on the American Falls make for a spectacular view. And this is why the Canadian side enjoys the edge. Good to know that every Friday, Sunday and public holiday firework happen at 10PM. Fortunately, I was there on a Sunday. At the stroke of 10, the sky went berserk. For the next 10 minutes or so, all eyes were glued up in the heavens. And the best part is the fact that this is free to public. By 10:30PM I was in my room. Tomorrow would be another exciting day… a day visit to Toronto with a few stops enroute. While I have featured Toronto separately, it would be apt to make note of 3 brief stops. 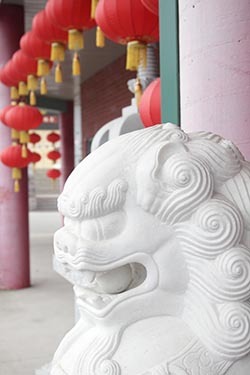 Just opposite to the White Water Walk is the Cham Shan Temple (Ten Thousand Buddhas) - The 7 level Chinese style building contains precious collections of Buddhist arts and artifacts. Experience the tranquility and spirituality of the temple. A bronze Buddha Statue and a Bodhisattva Avalokitesvara's statue are situated in this property so numerous tourists and devotees can cherish this great chance to make offerings and pay homage to the Buddha. Entrance is free of cost. 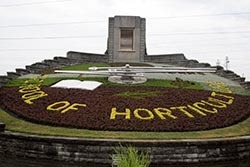 Further 7 kms away, is the Floral Clock. It’s a very popular sight of a huge working clock that contains over 20,000 small plants. The Westminster chimes every quarter. A fun spot to spend a few minutes. A few kms further up stands Brock’s monument. Canada and the United States today share the longest peaceful border in the world. Almost two hundred years ago, however, control of the Niagara River section of this international border was in constant dispute. Many decisive battles of the War of 1812 occurred along both sides of the river. Major-General Isaac Brock, Commander-in-Chief of British forces in Upper Canada was stationed at Fort George in Newark (now Niagara-on-the-Lake). He had just returned from a victory over American forces at Detroit. Now he observed the build-up of troops on the American side of the Niagara River from Buffalo to Youngstown. On the fateful morning of the battle, Brock raced from Fort George to Queenston. In a valiant effort to retake the Heights of Queenston, he was fatally wounded while leading his troops into battle.